The Olay Professional Pro-X Advanced Cleansing System is hugely popular and gets great reviews. In fact, out of 272 reviewers on Amazon, (at the time of writing) it gets a pretty amazing 4.5 out of a possible 5 stars. It is inexpensive, as are the Pro-X Replacement Brush Heads and the Exfoliating Renewal Cleanser used with the product. The Olay Professional Pro-X Advanced Cleansing System cleans your skin six times better than normal cleansing. If you use an anti aging moisturizing product, using the Pro-X system will help your skin to gain the maximum hydrating effects from the product. The two speed rotating heads use a soft, water resistant bristle brush head. Replacement brush heads are available in packs of two as mentioned above. Using the exfoliating cleanser which is recommended with this product produces a gentle exfoliating effect on your skin. This will help in clearing blocked pores and getting rid of blackheads and blemishes. The product runs on two rechargeable AA batteries which are included in the kit along with a sample of the cleanser. This system is really designed for those with normal to dry skins. Olay claim that the Olay Professional Pro X Advanced Cleansing System is as effective as a product by another skin care company which retails at around $200 (naming no names but the name of the film “Mamma Mia” might give you a clue)! To use, simply moisten both your face and the brush head of the unit with plain water. Dispense sufficient of the exfoliating cleanser onto your damp hands and gently massage onto your facial skin. Switch on your Olay Professional Pro X Advanced Cleansing System and move this over your face, paying attention to any problem areas for approximately one minute. Be sure to avoid the area around your eyes. Then, rinse your face with tepid water and pat dry. Always rinse the brush head with water after use. The product is lightweight and waterproof and can be used in the shower if you wish – in fact, the shower is one of the most popular places to use this product. Reviewers report that their skin felt ‘sparkling clean’ after using the Pro-X system. Everyone also felt that the rechargeable batteries were a good idea, especially when travelling and it only takes about an hour to recharge the unit. One review that I read was from a lady of 56 who suffered from pimples, clogged pores and embedded blackheads. She reported that after regular use, once a day (because more often than this caused her skin to feel too dry), she was ‘amazed’ at how much better her skin looked, the spots and clogged pores were well on the way out and the blackheads had disappeared! Get the Olay Professional Pro-X Advanced Cleansing System on Amazon right now at the discounted price of $26 with free super saver shipping! 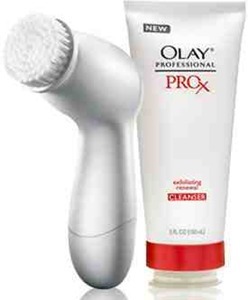 Overall, if you want an exfoliating brush product and only want to use it on your face and are rather hesitant to spend $200 or so on the Clarisonic Mia Pro or similar product, the Olay Professional Pro X Advanced Cleansing System represents amazing value for money, reliability and effectiveness. It will cleanse and exfoliate your skin leaving your complexion smooth and soft and more receptive to absorbing expensive anti aging moisturisers. More than two hundred reviewers on one site have given this product a definite ‘thumbs up’!